The Pacific nation of Vanuatu is preparing to permanently evacuate the entire population of one of its islands. Thick ash from a volcano kills crops, dirties water, and pollutes the air for the 10,000 people who live on Ambae Island. Some are eager to leave, but others are resisting losing their land and culture. Most people on Ambae live by farming and fishing. Hundreds of people have already created temporary homes on parts of the island that are not so affected by the ash. Ambae is one of about 65 inhabited islands in Vanuatu, an island country of 280,000 people. The country is on the Pacific Ocean’s “Ring of Fire” -- an area where earthquakes and volcanoes are common. The people who lived on Ambae Island were temporarily evacuated last September when the volcano erupted. This time, authorities are planning a permanent move. FILE - Residents wait on a raft to board a boat as they are evacuated from the Pacific island of Ambae, which is part of Vanuatu on Wednesday Sept. 27, 2017. Countries including France, New Zealand and Australia provided aid and financial help for the earlier evacuation. On Thursday, Australia announced it was providing 300,000 Australian dollars (about $226,000 US) to help with the island’s permanent evacuation. Government spokesman Hilaire Bule told The Associated Press that he expects the move to be approved by next week. He said officials still had to organize many details, including providing schools for students and homes for people. 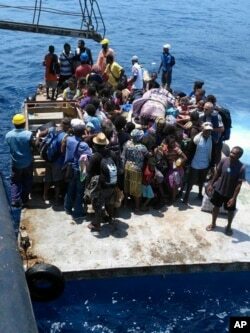 Bule said the population will be offered places on two neighboring islands, Maewo and Pentecost. Many people from Ambae have close family and spiritual ties to the two islands. Traditional religion says that the three islands are part of a family - Pentecost the mother, Maewo the father and Ambae the son. When asked if the islanders might be able to move back some day, Bule said that was not a question for him. Hai Do adapted this story for Learning English based on the AP news reports. Kelly Jean Kelly was the editor.